Length: 78 hrs. 20 min. "This is how much God loved the world: He gave his Son, his one and only Son. And this is why: so that no one need to be destroyed; by believing in him, anyone can have a whole and lasting life." Those familiar with any part of the Bible will recognize John 3:16, with a mind-altering difference. The words are fresh, new, and sound like the 21st century. That's because they are from The Message, a presentation of the Word of God crafted for a modern age. Eugene Peterson, translator and editor, learned from his years of teaching and pastoring that most people, through familiarity or frustration with the Bible, were missing the whole message of Scripture: the Word that God uses to create and save us, heal and bless us, judge and rule over us. So he set out to give us that word in language we use every day, a reading Bible that would enable the Word to penetrate our hearts and minds, transforming us day by day into the person God desires us to be. 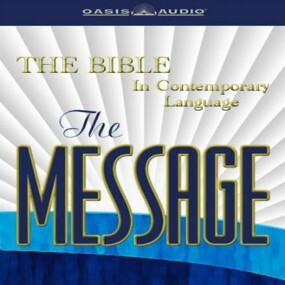 An audio Bible that penetrates our hearts and minds, transforming us day by day into the person God desires us to be. Written in the same kind of language you use to talk with friends, write letters, and discuss politics, The Message preserves the authentic, earthy flavor and expressive character of the Bible. For more than 6 million readers, Eugene Peterson’s unique style has opened up new understanding and insight into God’s Word.